Chamonix! What an incredible mountain town. Everybody should visit Chamonix once in their life. A vacation in Chamonix has everything! Great hiking, great food, great views and (usually) great weather! We love gazing up at Mont Blanc, the tallest peak in the Alps. 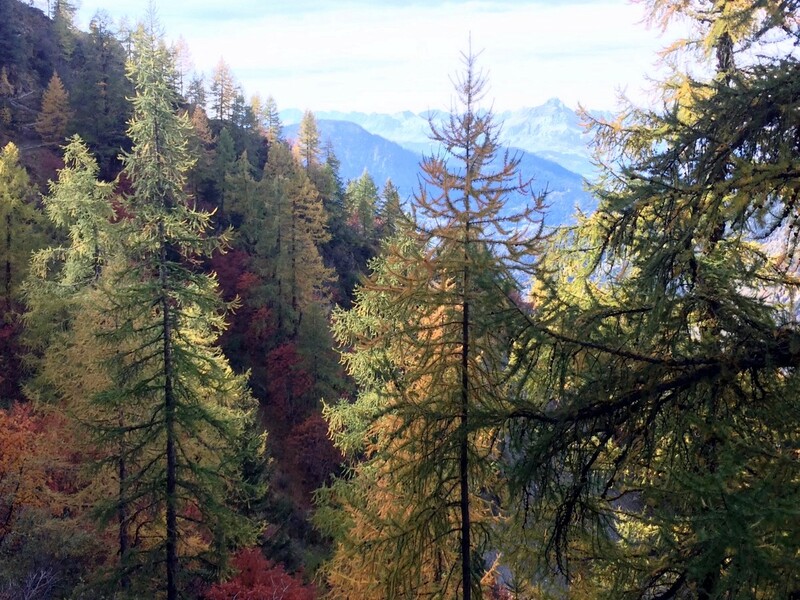 If you need help planning your holiday in the Chamonix Valley then look no further. 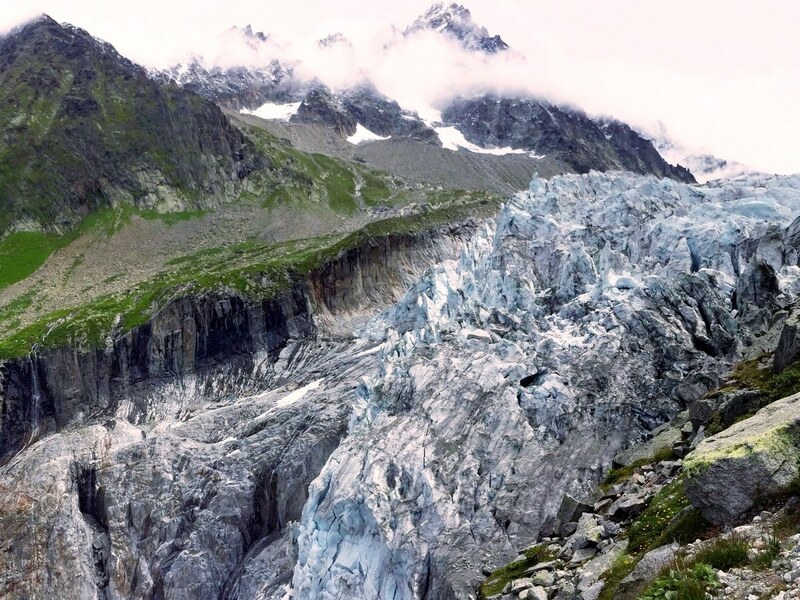 The beautiful region of Chamonix-Mont-Blanc (typically shortened to Chamonix) is the birthplace of mountaineering. Today it is a great base for climbers, skiers, bikers, hikers, families and just regular travellers. We love the Chamonix Valley. But it’s not just the town of Chamonix. Obviously, we recommend staying in Chamonix proper, but we also enjoy Argentière and Les Houches. Argentière is a little smaller with some great chalets and apartments to rent. Les Houches is typically a little less expensive, but it is a 30-minute bus or ten-minute drive to get to Chamonix.  When we hear people are planning a family holiday, we usually mention Les Houches to the parents because there are some great vacation rentals, hotels and restaurants there that we love and they are more kid friendly. 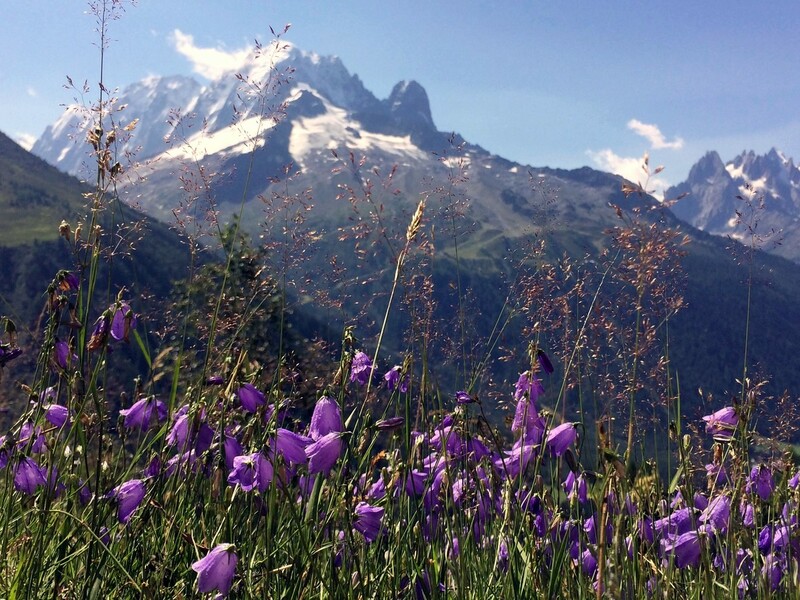 Chamonix has a wide variety of attractions, so it isn’t simply a hiking holiday. The summer gondolas and trains take you on wonderful journeys and make your hikes easier, allowing you to glide up the steep incline and start in the Alpine. 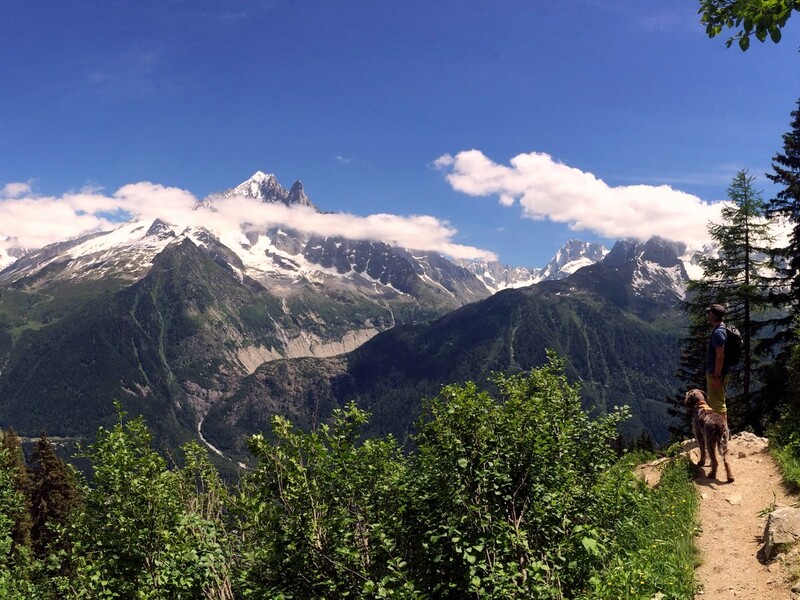 You shouldn’t feel the need to hike everyday in Chamonix. 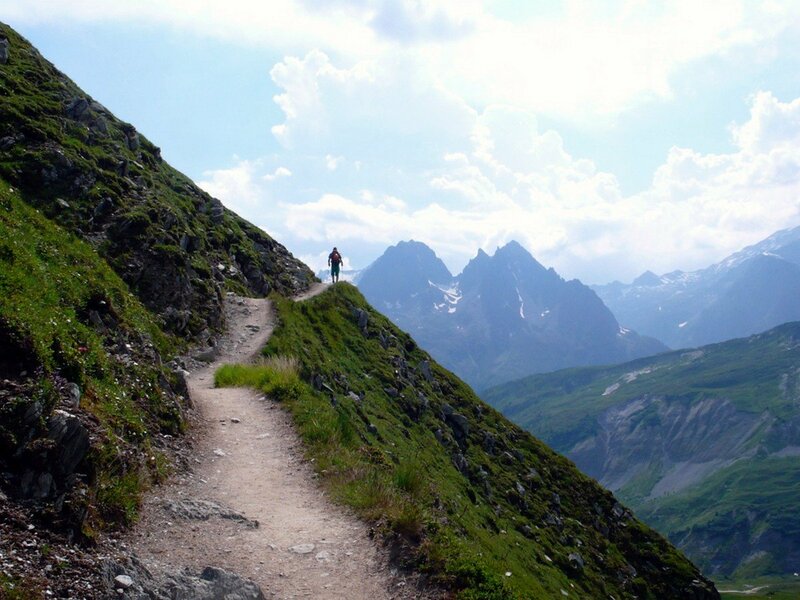 That being said, once you get there you just might try, especially once you check out our Top 10 hikes in Chamonix. So what are you waiting for? Start planning your trip to Chamonix already! Geneva Airport (GVA) and the Lyon Airport (LYS) are the two best airport options because they are both open year-round and regularly served by many international airports. Lyon is a two-hour drive away from Chamonix and there are regular transfers with Chamonix First. Geneva is closer by an hour and they too have many companies offering transfers to Chamonix. Check out this post on shared transfers to find out the best option for you to get to Chamonix. In Chamonix tourists come to ski in the winter and hike in the summer. Typically you can still ski in the spring, and actually a lot of people prefer it to the winter. Just be careful it doesn’t get too warm. In the autumn you usually can keep hiking well into autumn, and in low snow years hiking in December may be possible, depending on weather conditions. The transit system in the region in Chamonix is very good. Buses and trains can get you from place to place if you are willing to wait a little longer. You can certainly rent a car if you like, and if you’re staying in Les Houches this might be advised. We heartily recommend using transit though, and in fact we wish more mountain towns were as well-serviced as Chamonix. There is a great guest card you can get that lets you use the transit for a great price. Check out the Chamonix Website for some details about what they offer. We love staying in Chamonix. Being close to the shops, restaurants makes paying a bit more worth it for us. Let’s begin with some Chamonix luxury. 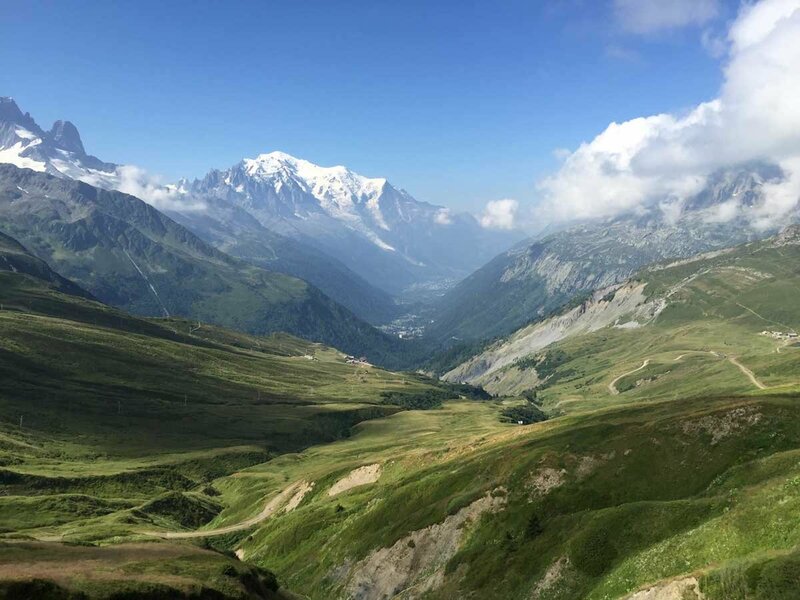 Imagine our delight a few years ago when we walked into Chamonix on a long-distance trek to find out there was an incredible special at Hôtel Mont-Blanc. This is the original Chamonix hotel, and it is spectacular hotel in a great location. After showering, we spent days lounging by their spectacular pool drinking cocktails and savouring this wonderful historic hotel. Hameau Albert 1er is a five-star hotel with a world-class restaurant. One look at the video on their website’s homepage will be more than enough to convince you, but let us add some sweetener to that. They have a beautiful spa and pool area. That restaurant we mentioned has stars of its own: two of them and they are Michelin. It’s located in Chamonix and it’s our pick for the regions more luxurious hotel. Le Hotel Chamonix Labrador is a great upper-mid range hotel. It has balconies that open onto the Golf Course and backs onto views of Mont Blanc. It has a breakfast buffet, a chalet feel and, for the location, we think it validates the price. The view of Mont Blanc makes it great for any season, but the golf course makes this hotel especially great for the summer months. Chalet Ski-Station in the Chamonix city centre is a perfectly situated hostel. If you’re looking for a budget place for the skiing season you should look no further (and book early). 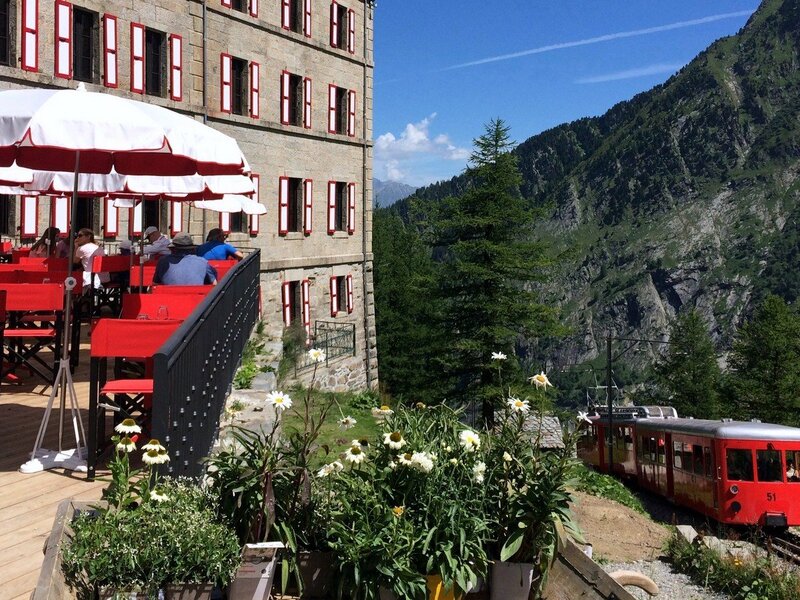 This hostel is very close to the Brévent Cable Car and some good Chamonix restaurants. If dining out is too much, use the hostel’s shared kitchen. 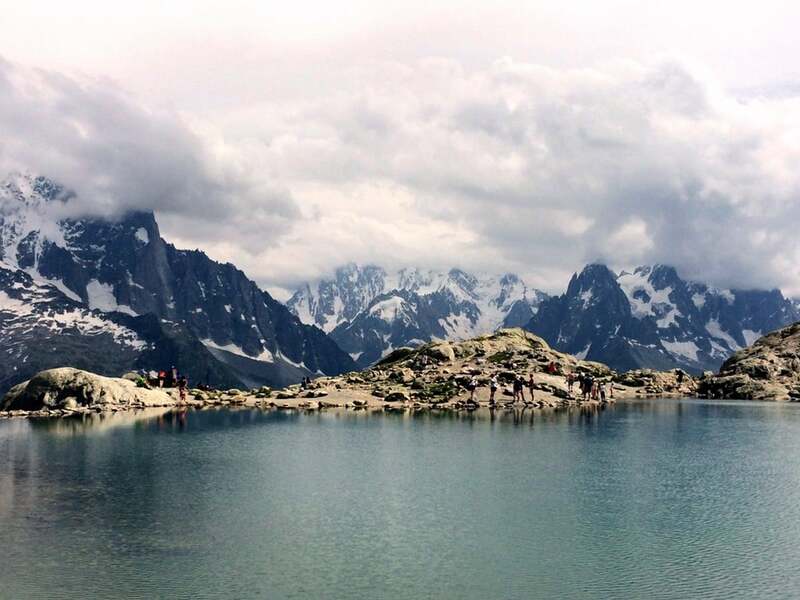 We think this is a fantastic spot if you want to be in Chamonix proper. They also have free Wi-Fi. The second place to stay in the Chamonix we recommend is Argentière. It’s a pretty compact village with good train and bus connections, so you hardly need a car. Walking around this village is simply superb. We like Yeti Lodge where guests can pick from an amazing selection of Chalets and apartments that are expertly managed and catered. This is the proper and classic way to see the Alps, especially with a larger group. The Le Dahu Hotel is the perfect mid range option. The rooms aren’t overly spacious (at the lowest level at least) but they are crisp, clean and the breakfast buffet is a great way to start your day. For something a little more affordable you can try Hotel de la Courone. It’s not as new as Le Dahu, but it is a little easier on the budget. Finally, for a great hostel recommendation we recommend Gite Le Belvedere. The hostel has free Wi-Fi and a top-notch location. There are lots of smaller rooms inside with a varied numbers of beds. The coffee is good too. There are lots of places in Les Houches, which is more reasonably priced and caters well to families. Airbnb.com has many great options for Les Houches. For something more affordable in Les Houches, you can try the Rocky Pop Hotel. This is great for families. The rooms are very hip and modern. The restaurant can do gourmet burgers or traditional French cuisine. It’s a larger place and for less experienced travelers (no shame in that) they make everything very easy. We enjoyed Le Chalet de Pascaline in Les Houches. It’s a mid-range B&B in a charming local home. The hosts and cuisine make you feel like you’re part of the town. It’s a little dated, but not run down (hence the adjective “charming”). Itching to hike? Why not camp by one of our most intense hikes in the area? Try Camping Le Grand Champ if you want direct access to our hike, La Jonction. The Campsite has 24-hour hot showers and a nice covered dining area with free Wi-Fi. Finally, we can’t recommend hiking to a Refuge highly enough. We list the closest refuges in many of our hikes for this region, so consider a 1-night refuge visit. Staying in the mountains makes a trip so much more special. Truthfully, it is hard to list the best restaurants in the Chamonix Valley. The food throughout the valley is very good to great. It’s rare that we try a restaurant and have a bad experience, nevertheless, here is our attempt at listing our favourites. Beware that many restaurants adjust their hours and may close outside of the main winter ski season and summer (July and August). Let’s start in Chamonix, and let’s start with something everyone can enjoy. Our favourite reasonably priced dinner spot is La Tablée. They have great French classics like French onion soup and fondue. They steak there is also excellent. The restaurant is well located and well priced. The most fun, cheap eats place in the whole Chamonix region is Cool Cats Restaurant. They do amazing hot dogs, fries, and other street food hits. The place is hip and unique and the food is crazy good. This is a must for anyone who likes a good hotdog. For a fancier meal try the restaurant in Le Vert Hotel. It’s a French based menu, but the chef uses lots of influences to keep the menu du jour exciting. The prices aren’t as high as the next restaurant we’ll mention, but we still consider this fine dining. From the bar and terrace you can see Mont Blanc. We believe the nicest meal in Chamonix is Le Maison Carrier in the Hameau Albert 1er hotel. It’s a country style restaurant, but don’t let the rustic look fool you. This place has two Michelin stars. It’s a foodie’s heaven to be sure. Make sure to check out Le 3842 for lunch if you’re taking the trip up to the Aiguille du Midi. The restaurant gets its name from the altitude from where it sits. The food is surprisingly well valued, but the best part is the views. In Argentière the options aren’t as vast as Chamonix, but it is France after all, so there’s good food everywhere you look. A great little café in town is Tête à Thé. They have quiche, baked goods, and little salads. We love going here for lunch or breakfast. For a cheap bar with good food try Les Marmottons. It’s at the bottom of the slopes, which is great for skiers. It’s also open in summer as well. It is simple French bites at a good price. If you’re looking for a fancier dinner in Argentiere we have two options. The cheaper option is La P’tite Verte. This is honestly one of the best values in Argentiere, but you will need a reservation. The food is wonderful and not too fancy. For fine dining you’ll want to go to La Remise. They have amazing entrees, like aged steak, as well as a tasting menu. We’re going to stick with the idea of Les Houches being perfect for a more budget conscious trip, so the restaurants are here are well valued and most are good for kids. For a great dinner after an active day take the family to La Ferme des Agapes. It’s a big, old tavern with cheese fondue and these great mini-BBQs that they can bring to your table (on which you typically cook beef and turkey). It’s hardy and delicious French mountain cooking. If you happen to be on the Ski hill in Les Houches stop by Les Vieilles Luges. It’s midway down the hill and the restaurant is in an old farmhouse. They have good food and a great atmosphere. Sometimes you just need a pizza, even when you’re visiting France. Well, good news is the best cheap eats in Les Houches is Pizza Lou Vio. It’s the best option in Les Houches, but not our best cheap eats option on the whole list. This is good if you get back to Les Houches and don’t feel like bussing back into Chamonix. And finally, we think the best restaurant in Les Houches is Le Delice. This is certainly an awesome restaurant, but it’s not something gastronomically over the top (although those aren’t necessarily bad things). What’s nice about Le Delice is that you can have a great fancy dinner, but you could also bring the kids. They do have a few items on a kid’s menu. WHAT ELSE CAN YOU DO BESIDES HIKING IN Chamonix? When you’re in Chamonix and you’re not hiking most people just find ways to soak in the natural beauty without the physical excursion. We totally get it. Not everyone can do a big hike everyday. The solutions are vast and wonderful. The best part is that for 63 euros you can get a pass for a bunch of lifts and sight seeing activities. Here’s what we loved most from that list. First, you can, wait you MUST take the cable car up to the viewpoint at Aiguille du Midi. The oxygen can be a little thin (nothing extreme) at the top, but the views are jaw dropping. While you’re there make sure to go up the elevator and “Step into the Void.” This section of the visitor centre lets you stand over a see through floor, which is always great for photos. In the visitor’s centre there is also some historical background on the surrounding area. The next sight seeing adventure is the Brévent Cable Car. 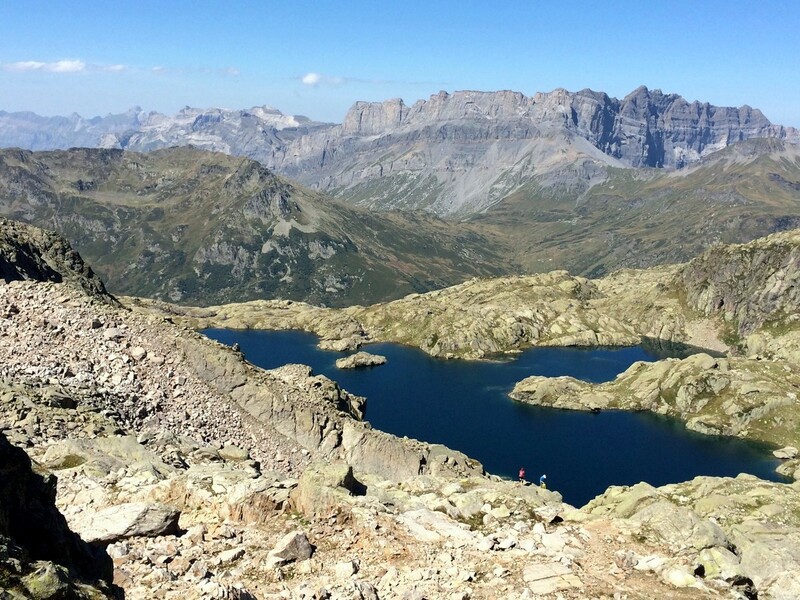 The Brévent area is beautiful (as a side note, we have two hikes near that area: Lac Cornu and Gran Balcon Sud). The final low-impact, mountain adventure is the Montevers – Mer de Glace Train. This train takes you up to the Mer de Glace glacier and from there you can take a few hundred steps down into the ice cave. This part is especially mesmerizing. If you’re after some traditional European sightseeing visit the Eglise Saint Michel in Chamonix. A seasoned European traveler might not find it out of the ordinary, but we’ve found that if you stop here in the early morning, when the dawn’s light breaks through the stained glass, it can extraordinarily serene. It’s a beautiful and quaint church. If you got some older kids and teens with you, you might need some adventure activities to mix in with the hikes. 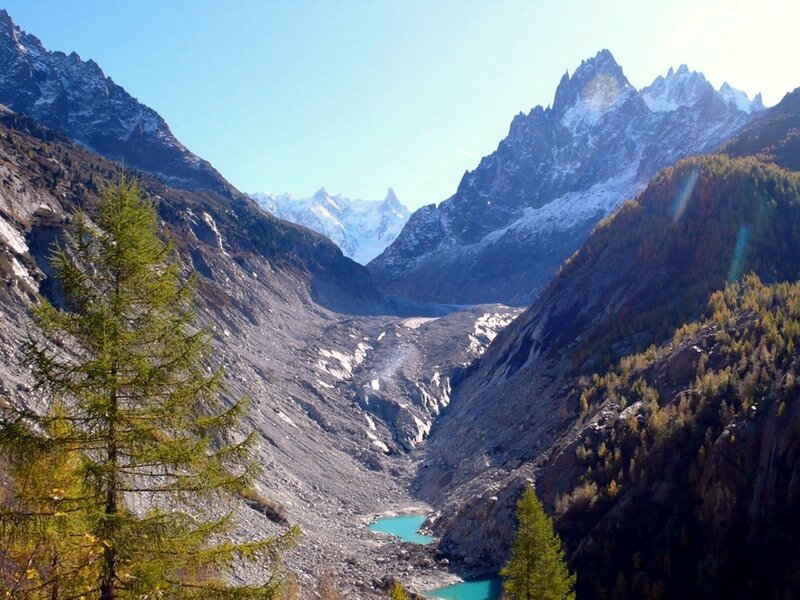 Now there are plenty of mountains to ski on in the winter, but in the summer you can visit the Chamonix Parc d’Attractions. The majority of the summer activities might be suited for younger kids, but we think their luge alpine coaster is fun for nearly all ages! If that’s not their style, some people love to try paragliding (though we’re too scared to try, to be honest)! You may not have considered attempting this, but beginners ride tandem with a professional, so it’s quite manageable. Always bring sunglasses, a hat and wear sunscreen—even in winter. The sun at the alpine altitude is very strong. If you’re planning on skiing, avoid hotels that advertise proximity to the to the Aiguille du Midi lift. That lift does not take you to any groomed runs. The Aiguille du Midi is great, however, for the summer because that viewpoint is something you don’t want to miss.